Spoiler Alert: If you haven’t already read John Van de Walle’s Teaching Student-Centered Mathematics, you’re going to want to get a copy right away!!! Several years ago, I had the amazing opportunity to meet and work with John Van de Walle for a brief time. 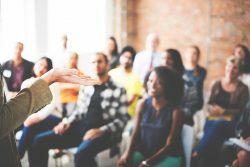 Subsequently, as I read the original version of his Teaching Student-Centered Mathematics, I was awed by the compilation of so many ideas I had read, heard, and discovered during my years as a classroom teacher and math coach. Honestly, I couldn’t put the book down. It brought together so many incredibly important ideas I had discovered over the years, all in one place!!!! Perhaps one of the most impactful messages in the book was the reference to groupable vs. pre-grouped base-ten manipulatives. It was only a two-page spread, but it sent me on a journey that has forever changed my professional life. 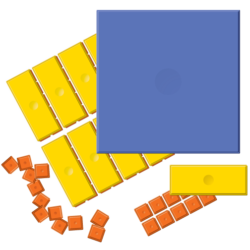 It turns out that pre-grouped physical models, including the most-commonly-used base ten blocks, can obstruct student understanding rather than support it. I had heard some of my favorite researchers, such as Constance Kamii and Pat Thompson, make similar claims in their talks, and it was in this moment that their words came to life for me. You see, in this very brief section, the authors stated that the potential is great for children to use pre-grouped manipulatives to demonstrate operations “without reflecting on the ten-to-one relationships or without really understanding what they are doing – this is especially true if children have not had adequate experience working with groupable models.” The added cognitive load increases dramatically when students must think about the structure of the manipulative in addition to representing numbers and operations (more on this next week). The authors suggest that we use objects that can be grouped into tens, such as popsicle sticks, beans, or unifix cubes. 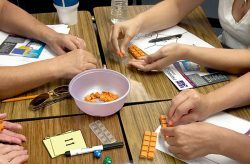 They go on to suggest that an organizing structure such as the ten frame might further help students internalize the grouping-by-tens structure. After reading this, my head started to spin with possibilities. What if we could somehow use ten frames in every place in our base-ten numbers to represent quantities, both large and small. How might this help children understand and internalize numbers and operations??? Well…that journey continues to this day. 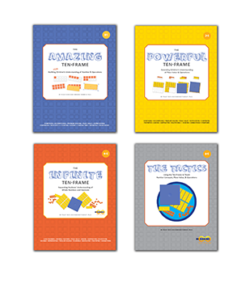 Peggy Akin and I joined forces a decade ago when we created Ten Frame Tiles, a groupable manipulative that helps children view mathematics in entirely new ways. This tool has the potential to transform the teaching of elementary mathematics. Interested in learning more? 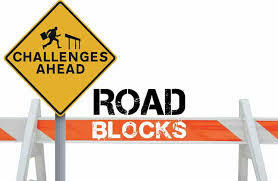 Check out Peggy’s series of journal entries, Beyond Base-Ten Blocks: The Search for a Better Solution. Each entry visualizes the contrasting ways base ten blocks and Ten-Frame Tiles address a common base ten standard and then speculates on the contrasting impacts on children’s learning — and, ultimately, on the way children think about mathematics. After reading this post, please share your thoughts in the comments box below. Have you faced frustration with base-ten blocks the way I did? Have you gone looking for alternatives? Have you found any that worked?